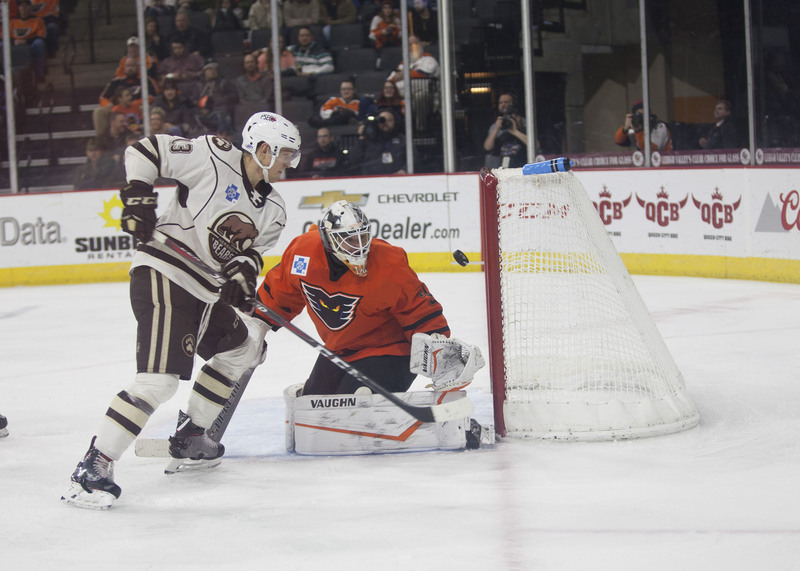 The Hershey Bears fell to the Lehigh Valley Phantoms 2-1 (SO) Wednesday night at the PPL Center in Allentown. The loss drops the Bears record to 20-20-0-3 on the season. The Bears are back in action on Saturday when they host the Laval Rocket at Giant Center. Puck drop is set for 7:00 PM. Scratches: Colby Williams (lower body), Lucas Johansen (upper body), Kris Bindulis (upper body), Steve Whitney (injury) were the injury scratches. Steve Johnson and Mason Mitchell were the healthy scratches. A relatively slow start to this one. The Bears led in shots on goal 3-0 after 11:15 of play in the first frame. The Bears would eventually strike first with a blast from Connor Hobbs at 13:08 of the first period. Garrett Pilon (15) and Nathan Walker (8) were credited with the assists. And that would be all of the scoring in the first frame. The Bears led in shots on goal 9-4. There were no penalties called in the first 20 minutes. The Bears and Phantoms would skate to a scoreless middle frame. The Phantoms outshot the Bears 15-10. The Bears were 0 for 2 and the Phantoms were 0 for 3 on the power play after 40 minutes of play. The Bears committed a pair of penalties early in the final frame, giving the Phantoms a 5-on-3 for a full two minutes. The Bears would kill most of it before the Phantoms finally found the back of the net. Greg Carey would pot the game-tying tally at 3:34 of the final frame. The Bears would get a brief 5-on-3 for 1:07 of the final frame, but the Bears could not capitalize on the opportunity. Regulation would end with the game tied 1-1. The overtime frame would go scoreless. Ilya Samsonov made two stellar saves to keep the game tied after the 3-on-3 period. The Phantoms would win it in the shootout. Ilya Samsonov made his fifth straight start for the Bears. In his previous four games, Samsonov had a 1.00 GAA and a .950 save percentage. Bears outshot the Phantoms 41-27. The Bears were 0 for 5 and the Phantoms 1 for 5 on the power play, the difference in the game. Riley Barber and Aaron Ness led the Bears in shots with 5. Samsonov stopped 25 of 26 shots. He was the third star of the game. This entry was posted in News and tagged Connor Hobbs, Hershey Bears, Jon Sorensen, Lehigh Valley Phantoms. Bookmark the permalink.